Archaeological conservation is the applied science of preserving artifacts. According to the Society for Historical Archaeology, “Conservators prevent objects from deterioration through careful examination, documentation, analysis, preservation, restoration and preventive care.” In our case, these archaeological materials come from a submerged saltwater site, which adds a level of complication to the work needed to protect the artifacts for future study and interpretation. We rely on a variety of interdisciplinary sciences, including chemistry, physics, engineering, and geology. A large majority of the Queen Anne’s Revenge site is covered in what we call concretions; dense, concrete-like lumps that are not naturally occurring and are not rocks. Concretion occurs when a mixture of iron corrosion product, sand, and sea life forms a hard shell around corroding iron artifacts, and can encompass other non-iron artifacts that may be nearby. They can range from an inch to several feet in size. In the warm waters of the mid-Atlantic coast, organic materials often do not survive, but we do find items such as wood, rope, and sailcloth when they have come to rest near an iron object, and are therefore preserved within the concretion. Cast iron objects (such as cannon balls, grenades, and cookware) are more stable and tend to survive within the concretion. Wrought iron objects (such as nails, hooks, and a variety of tools), on the other hand, are structurally more vulnerable to extreme corrosion, and sometimes there will be no solid iron remaining, leaving a void where the artifact used to be. It is often impossible to tell what artifacts a concretion may contain by simply looking at the surface, but we can reveal what artifacts are within using x-radiography. 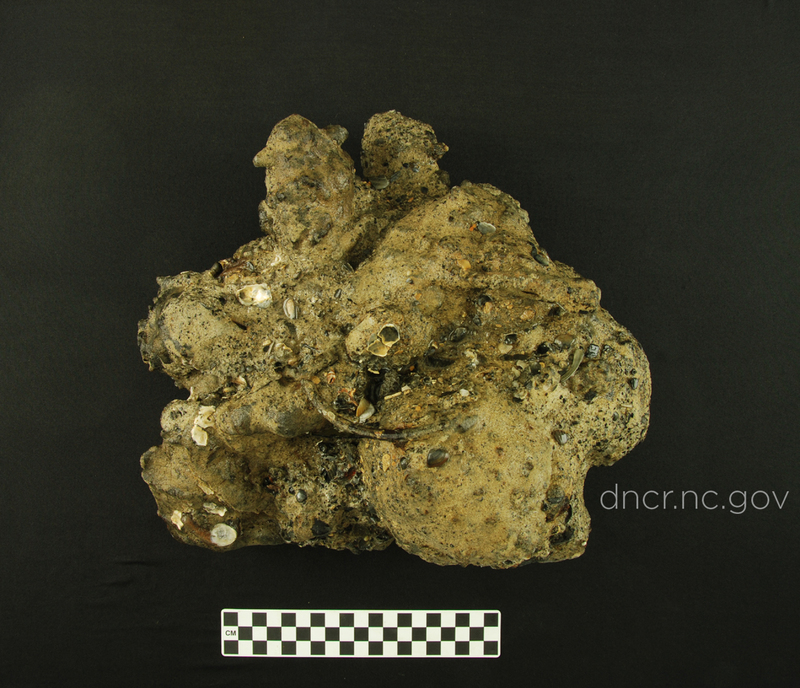 Stay tuned on the 15th of every month to learn more about the processes we use to remove artifacts from this concretion, and how we treat them! -Society for Historical Archaeology. “Conservation – Who, What, Where, When, Why, and How?” https://sha.org/conservation-facts/faq/conservation/, accessed 14 June 2017.